A stunning photograph taken from the ALMA observatory in Chile shows a young star surrounded by a large disk of gas and dust. 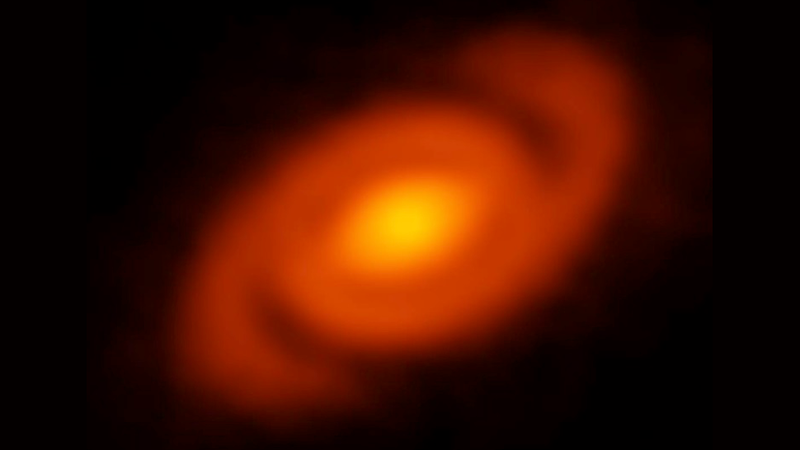 Like our very own Milky Way, this protoplanetary disk exhibits a spiral structure—a feature that could solve a lingering mystery about how planets start to form. This baby star is called Elias 2-27, and it’s located about 450 light-years from Earth. Those spiral arms that you see in the photo extend more than 6 billion miles (10 billion kilometers) away from the center of the system, which is further away than our sun is to the Kuiper Belt. Scientists have seen this galaxy-like feature before, but never at the circumstellar disk midplane—the region where planet formation takes place. The details of this unprecedented observation now appear in Science AAAS. Left: The Rho Ophiuchi star formation region at a distance of 450 light years (left). Right: Thermal dust emission from the protoplanetary disk surrounding the young star Elias 2-27. The presence of these spiral arms comes as a relief to astronomers. Planets form in the disks of gas and dust around newborn stars, but it’s not clear how these tiny particles grow into objects as large as Saturn and Jupiter. When the protoplanetary disk is smooth and even, objects can only grow in a cumulative fashion as particles continually collide and clump together. Trouble is, when these bodies get a couple of feet across in width, the drag created by the surrounding gas makes them migrate towards the star. This process only takes about 1,000 years, but larger timescales are required to build considerably bigger objects, and eventually planets. The observed spirals in Elias 2-27 are the first direct evidence for the shocks of spiral density waves in a protoplanetary disk. They show that density instabilities are possible within the disk, which can eventually lead to strong disk inhomogeneities and further planet formation. These sorts of instabilities aren’t specific to planet formation. Indeed, the best examples are the density waves in disk galaxies, which produces the spectacular arms of spiral galaxies. The presence of these arms in a circumstellar disk may help explain the formation of planets, but the next mystery to solve is the presence of the spirals themselves, and how they come to exist. A possible explanation is that a planet had already formed, but that presents a chicken-and-egg scenario. As the authors of the study themselves admit, more observations are needed.